Dry skin will show the signs of aging quicker than other skin types. Dryness makes wrinkles and sagging more pronounced. When you have dry skin, it means your skin barrier is disrupted, allowing moisture out and irritants in. 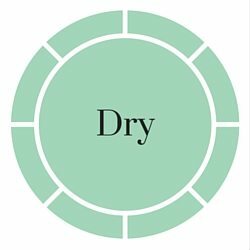 Dry skin types need products that will help repair the skin barrier and provide hydration, while avoiding drying ingredients such as alcohol. A cleanser, toner, potent serum, and a moisturizer. Products with collagen-stimulating ingredients such as vitamin C or peptides, to help keep your skin looking young. A hydrating sunscreen to prevent skin aging from UV rays. Hyaluronic acid (HA) is one if the best ingredients to look for in products for dry skin. HA pulls moisture from the air and keeps it in your skin. This guide will teach you how to create an amazing dry skin care routine to target the signs of aging. Disclosure: There are some affiliate links below and we may receive commissions for purchases made through links in this post, but these are all products we highly recommend. We won't put anything on this page that we haven't verified and/or personally used. ​Cleanse in the AM and PM with a hydrating cream cleanser. Look for a no-foam, no-lather, gentle cleansing lotion. Avoid foaming agents such as sodium lauryl sulfate as they will strip the skin and break down the protective layer. Use a hydrating toner to replenish moisture while also removing any last traces of dirt. Look for hydrating ingredients such as aloe vera or hyaluronic acid. Avoid ingredients such as SD alcohol 40, denatured alcohol, ethanol, and isopropyl alcohol. The word serum is often used to describe a water-based or oil-based product that is concentrated in active ingredients. Serums will absorb into the deep layers of the skin, bringing active, healing nutrients with it. Use an antioxidant-packed serum to reduce collagen breakdown. Vitamin C, A, and E are all good antioxidants to look for. Hyaluronic acid will plump the skin and reduce the look of fine lines. Plant oils contain the essential fatty acids, antioxidants, and lipids that our skin needs to stay healthy. Oils applied topically to the skin absorb into the epidermis and help keep moisture in and irritants out. Oils high in oleic acid are best for dry skin types. ​You can either add the oil to your moisturizer or use it alone. Apply your moisturizer twice a day after cleansing, toning and applying your serum. In the AM, a hydrating moisturizer will nourish and protect your skin. In the PM, a ceramide moisturizer will fill the gaps in your skin’s barrier layer, trapping moisture in and keeping irritants out. Dry skin requires moisturizers that are loaded with emollients. Ingredients to look for include: ceramides, glycerin, hyaluronic acid, and plant butters and oils. Look for moisturizers that contain oils such as camellia oil, olive oil, marula oil, argan oil, or avocado oil. Sunscreen protects against the #1 cause of aging - sun damage. Use sunscreen every day to prevent damage. Look for a physical sunscreen such as zinc oxide or titanium dioxide instead of chemical sunscreen, as these can irritate the skin. Using a moisturizer with SPF is a great way to get two products in one. If your SPF moisturizer is hydrating enough, you can skip the previous moisturizer step. Tinted moisturizing sunscreens are my favorite because they cover the white cast that the zinc oxide can create. Use your natural retinol alternative every night in place of your serum to refine and lightly exfoliate your skin, leading to brighter, smoother skin in the morning. Exfoliates remove the dead skin cells that make your skin look dull. They can also speed up cellular turnover, bringing young skin to the surface. Dry skin has a build-up of dead skin cells that make the skin look dull. There are two types of exfoliates; chemical and physical. Both remove dead skin cells but with different compounds. Physical exfoliates use small granules such as crushed up walnut shells or sugar, chemical exfoliates use acids or fruit enzymes. I recommend using a dry powder scrub that you can add to your face wash. If you find that your skin is looking dull, you can give it a light scrub to get your glow back. I don't recommend doing this more than a couple times a week. Chemical exfoliates such as glycolic acid and salicylic acid may be too harsh for dry skin, lactic acid or fruit enzymes are better options. If you do choose to use glycolic acid, make sure you follow its use with a rich night cream. Perform an enzyme or lactic acid peel once a week to keep your skin looking great. Masks can provide your skin with gentle exfoliation, deep cleansing, and a boost of skin-nourishing minerals. Look for masks that include hydrating ingredients. Use your mask 1-2 times a week, on days where you are not performing a peel. Clay masks should not be left on too long or they will over-dry your skin. Rinse it off while it is still tacky. The above product recommendations should help you get the youthful skin you desire. The most important aspect to treating dry skin is to avoid ingredients that dehydrate the skin, and by incorporating products with natural, hydrating ingredients. Let us know in the comments if you have any questions, we always answer!